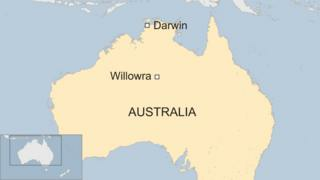 Four people have been found dead after a vehicle broke down in outback Australia, police say. The bodies of two adults, both 19, and their three-year-old son were found near a remote road about 1,000km (620 miles) south of Darwin on Wednesday. Northern Territory Police searching for a 12-year-old boy from the group say they have found the body of a child near the car. The deaths are not being treated as suspicious. Authorities are investigating whether heat may have contributed to the tragedy. The group was last seen leaving Willowra, a small community, on Friday. The adults and toddler were found about 4.5km from the vehicle. "One of the avenues we are looking at is that they have walked off from a vehicle in extreme weather and may have got caught out," Supt Shaun Gill told the ABC. "Initially we thought it was the result of a car crash, however we are confident it's not." After an extensive search, police found the body of a child about 120m away from the vehicle late on Thursday. "A formal identification of the child is yet to be undertaken and as such, police are unable to confirm it is the body of the 12-year-old boy," they said in a statement. Police said the alarm had been raised by a man who entered a health clinic in Willowra on Wednesday. "He will be a critical part of the investigation. He is quite distraught about what he has found," said Supt Jody Nobbs. Supt Nobbs said he could not give additional details, nor confirm whether the older boy was related to the family. The search is continuing as police say they cannot confirm whether there were other passengers in the car. Temperatures in the region exceeded 40C in recent days, according to Australia's Bureau of Meteorology. The tragedy follows the suspected heat-related deaths of two people in separate incidents in northern Australia within the last two weeks, the ABC reported.